Home safety means more than just avoiding falls. A safe home entrance, living room, bathroom and kitchen equipped with products that meet your needs can increase your independence and privacy. Following these suggestions may enable you to take care of your personal needs without assistance. 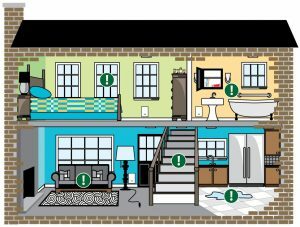 Let’s take a tour around your home and consider some easy steps to increase your safety, mobility and independence. Click on the house to see how you can stay home longer. Each room has information on safety and ways to improve everyday living. Advanced Home Care provides a full line of home care products and services that provide safety, independence and comfort. We are professionals specializing in home care. We are here to help YOU! Visit one of our 31 retail stores to begin transforming your home into the sanctuary for aging gracefully that you deserve. You may also visit our online store, Shop Online. While visiting one of our retail stores schedule your home safety consultation. Some of our locations even offer in-home assessment services ask a specialist today or the next time you shop with us. Complete a safety consultation and receive 10% off safety products recommended to you. Click here to learn more about Care+ Advanced Home Care’s customer loyalty program.